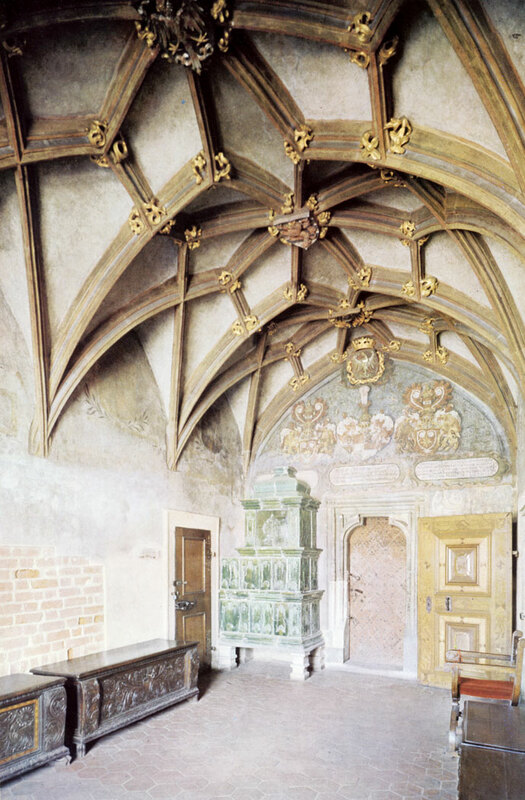 The Late Gothic room with remarkable polychrome vaulting was originally thought to be the bedchamber of King Vladislav II Jagello but is more likely to have served as offices of the Court of Chancery. It was built some time after 1484 by some predecessor of Benedikt Ried, who carried out alterations to the Castle, perhaps by Hans Spiess. The Old Diet was rebuilt by Benedikt Ried around 1500 but badly destroyed during a fire in the Castle in 1541. It was reconstructed by Bonifaz Wolmut in the years 1559 - 1563 when a Renaissance tribune was added for the Chief Clerk to the Diet, which was accessible from the Office of the Land Rolls. 'Apart from important resolutions passed by the Diet the Land Rolls recorded all changes in property holdings of the Estates in the Czech Lands. During the Fire of 1541 the original premises of the Land Rolls were destroyed and with it all the old Land Rolls. The new Office was built in Renaissance style in the middle of the 16th century. 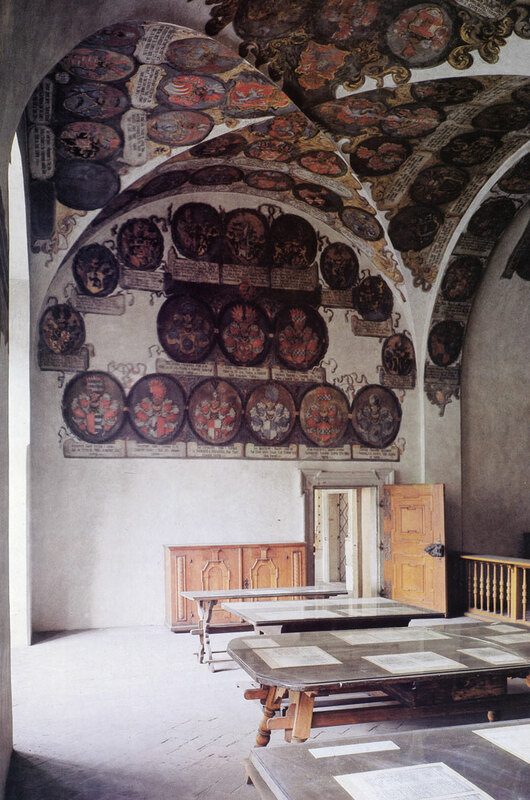 The ceilings and the walls are adorned with the coats-of-arms of the Clerks of the Land Rolls during the period 1606 to 1758. 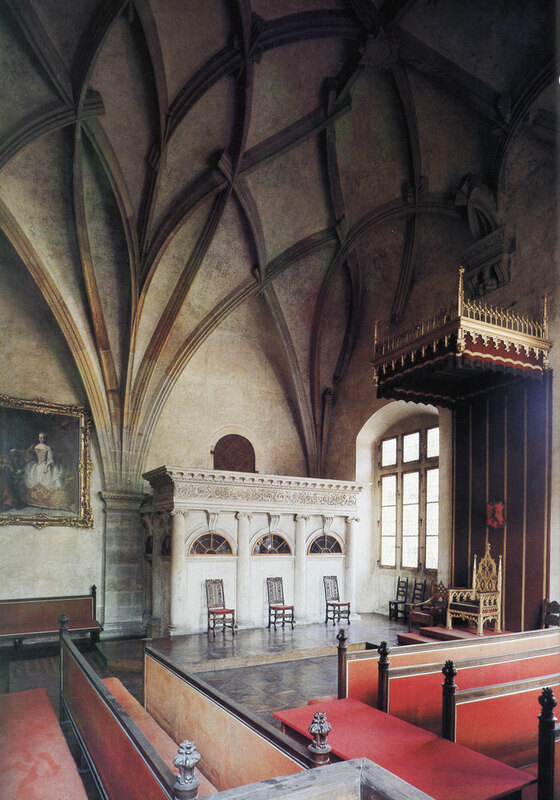 The Vladislav Hall was built by Benedikt Ried of Pistov in the yoars 1486 - 1502. 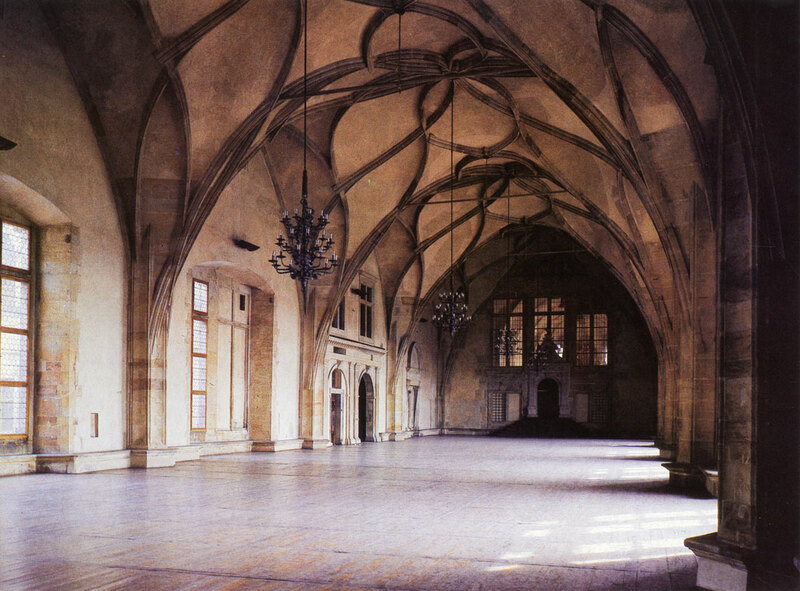 In size (length: 62 in., width: 16 m., height: 13 m.) it was the largest secular hall in contemporary Prague, and served as a Hall of Homage of the Kings of Bohemia. In the second half of the 16th century, when merchants set up their stalls in the Hall, it became a remarkable centre of social life. In recent time all important acts of state have taken place in the Vladislav Hall, in particular the election of the President of the Republic. 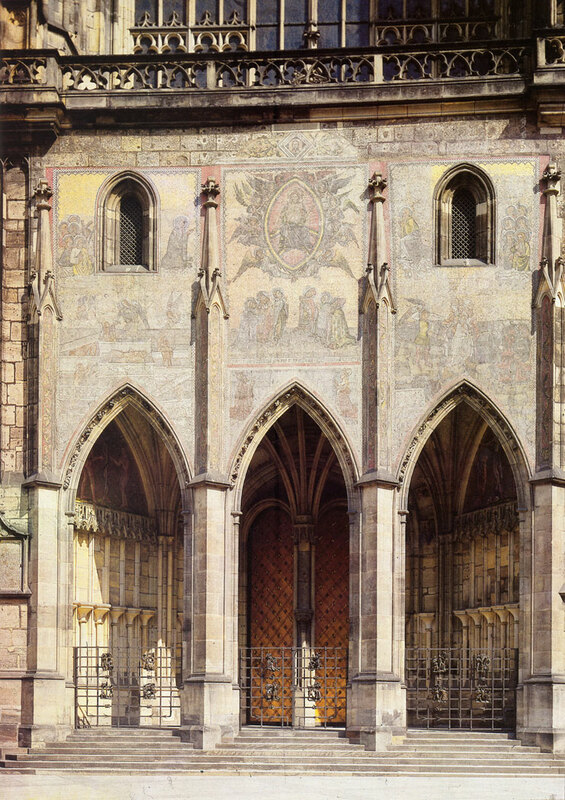 The Golden Gate of St. Vitus's Cathedral was built in the years 1366-1367 by Peter Parler's masonic lodge. Around 1370 Venetian artists adorned it with a glass mosaic depicting the Last Judgment. 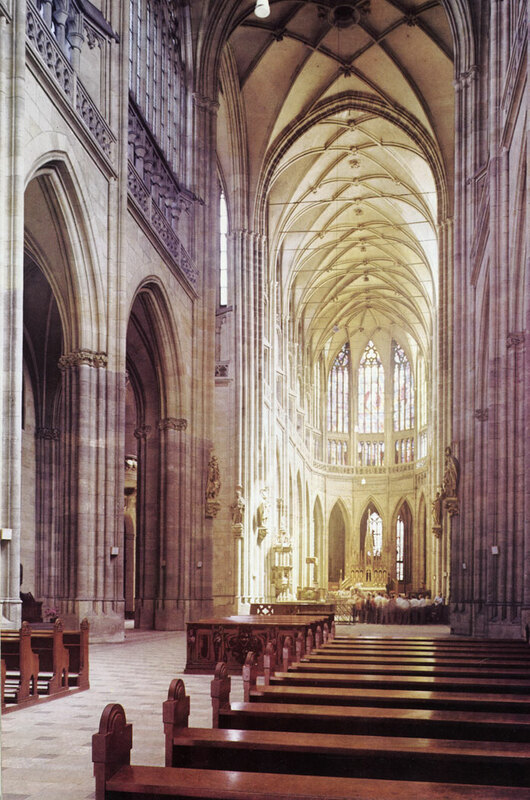 The Gothic Cathedral of St. Vitus was founded by Charles IV in 1344 on the occasior when the Prague bishopric was raised to the status, of archbishopric. The first builders of the mightiest ecclesiastical edifice in Prague were Matthias of Arras (1344-1352) and Peter Parler (1356 - 1399), whose descendents con­tinued construction work until the outbreak of the Hussite Revolution in 1419. In the first and most important stage of construction work on the Cathedral the choir with its chapels as well as the main tower came into being, the latter, however, remained un­finished. 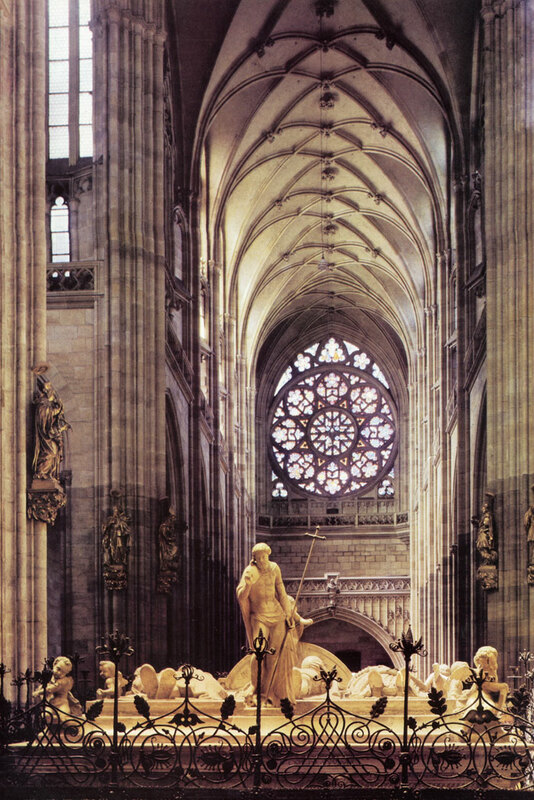 The nave of St. Vitus's Cathedral is a Neo-Gothic structure made in the 19th and 20th centuries under architects Josef Kranner, Josef Mocker and Kamil Hilbert. The coloured rose window on the facade was made in 1921 to a design by Frantisek Kysela. 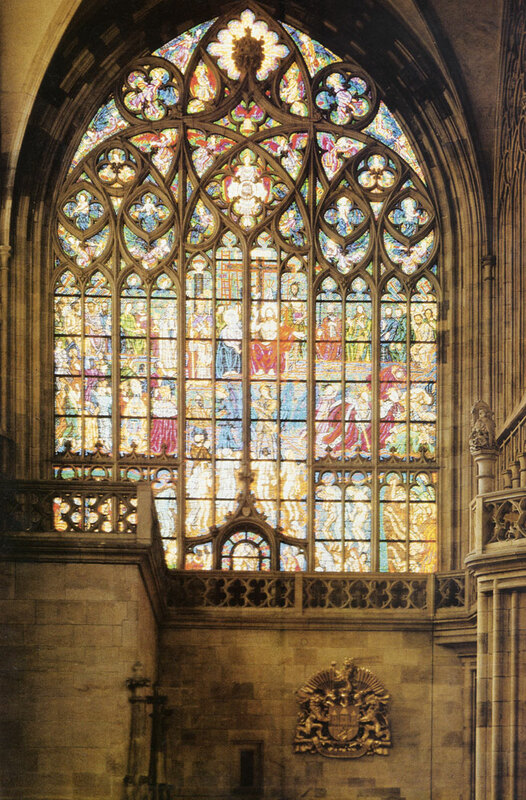 The main window of the southern transept of St. Vitus's Cathedral was completed by architect Kamil Hilbert in 1916. Its glass dates from 1939 and was made to a colour design by Max Svabinsky; it depicts the Last Judgment. 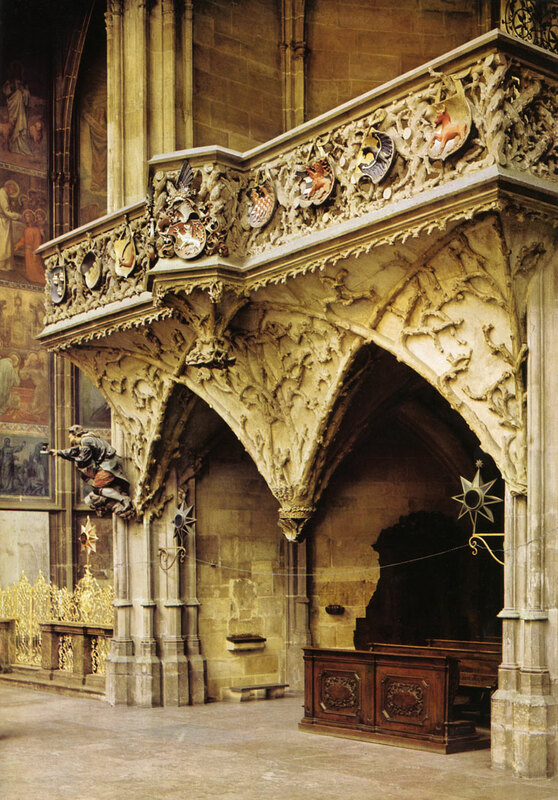 The Royal Oratory in St. Vitus's Cathedral, linked to the Old Palace by a covered passageway, was built by Benedikt Ried and Hans Spiess in 1493. The ribs of the vaulting are stylized to represent branches; the oratory is adorned with the coats-of-arms of Bohemia, Moravia, Silesia and Lusatia, Hungary, Poland, Dalmatia and Bosnia, i. e. the countries which, with the exception of Poland, came under the rule of Vladislav II after 1490. The statue of a miner by Matthias Braun was added to the Oratory after 1721. The St. Wenceslas Chapel, built as a tomb for St. Wenceslas, was assigned the most distinguished place already during the construction of the Cathedral. The first stage of chapel construction was completed be­fore 1358, the second, under Peter Parler, in the years 1362 - 1364. 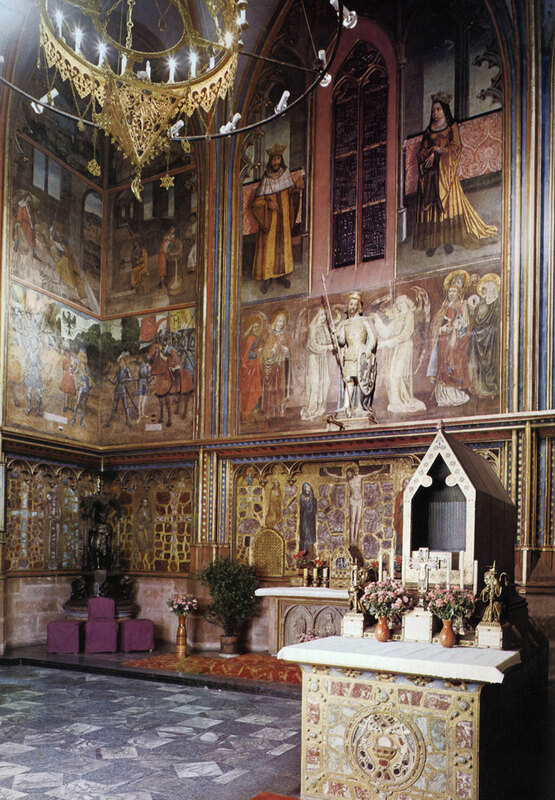 The lower part of the chapel was adorned in the course of 1372 - 1373 with a cycle of mural paintings depicting the Suffering of Christ, framed in an encrustation of semi-precious stones. 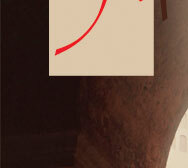 In the years 1502-1509 Renaissance paintings were added on the upper parts of the walls. The tomb of the Saint, dating from the 14th century, underwent resto­ration in 1912-1913.